After looking at the video I shot with Delkin’s Fat Gecko standing straight-up, I realized I needed to make some changes. It still bobbed too much. Every sway and bump caused a wave of vibration through the video. It needed to be more secure to be video-ready. I decided that the lens needed its own support to help stabilize the entire set-up. Luckily, the Fat Gecko has a little brother called Mini Fat Gecko. It has only one suction-cup but a secure build similar to the full-sized unit. But, there is no lens collar available … but it is a GREAT IDEA!!! DELKIN — Go make it! I decided to improvise something quickly. I wrapped the column in the ultimate high-tech accessory … Bubble-wrap! I folded the bubble-wrap over the top to create an extra cushion and then wrapped the whole thing in Gaffer’s Tape (actually Painter’s Tape-Delicate which is cheaper). I also decided to fold the main neck of the Big Fat Gecko down to reduce the drag. In this new position, the Mini Fat Gecko with the bubble-wrap padding aligned perfectly. A little more tape around the two to keep it secure and I was done. Adorama has the Fat Gecko in-stock for $69.95 and the Mini Fat Gecko for $34.95. I was very disappointed w/ my mini gecko mount w/ my Sanyo HD 1000 cam. Mounted on my motorcycle gas tank….the cam still bobbed when I hit potholes or other road imperfections. NO post video stabilization will correct that. 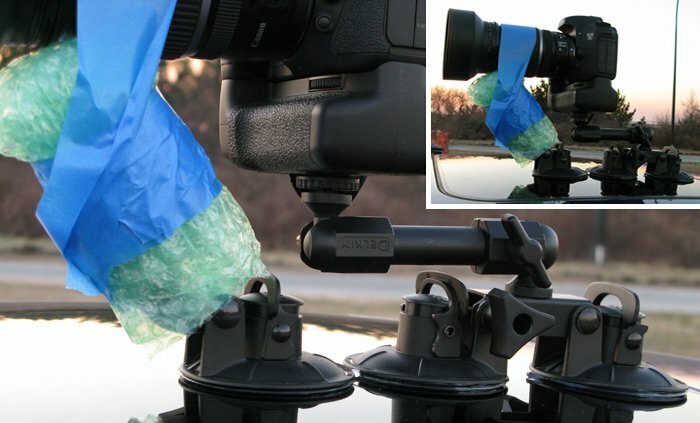 I have seen other brands that have a “post” right underneath the arm to help stabilize the cam but are not as powerful suction wise. I was able to attach the mount to helmet w/ better results. The human body works as a great cam stabilization tool! LOL Too bad just holding the cam isn’t an option because that would be more steady than any mount I know off. I will try to figure a way to hold the arm down maybe w/ some masking tape to help stabilize the whole set up. Thanks for the idea. I actually had several conversations with Delkin about a dual-mount Gecko but nothing has come of it. Until there is a “real” solution, using the two Geckos plus the Gaffer’s Tape and bubble-wrap definitely improved the wobble. Be sure to position the main Gecko arm as close as possible to the hood or motorcycle too.